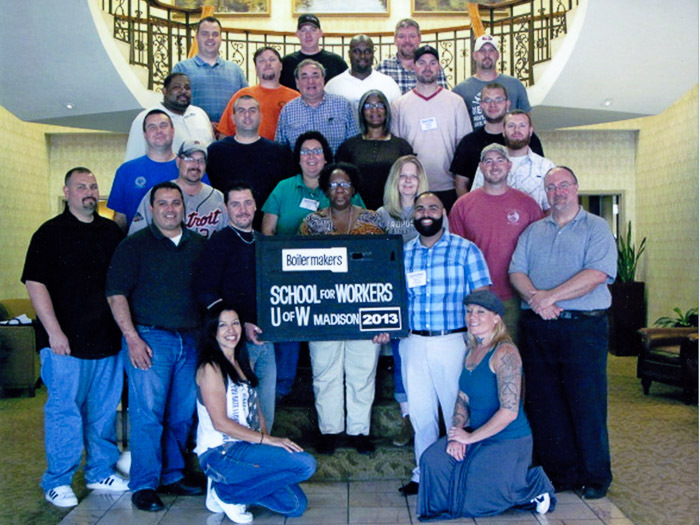 The week-long “Boilermaker Summer Institute” offered participants intensive training in fundamental union leadership skills involving contract administration, grievance handling, collective bargaining, and numerous other topics. Classes were taught by the faculty of the University of Wisconsin Extension, along with staff from the International Brotherhood of Boilermakers. This was the 56th year that the Brotherhood has participated. The Advanced Class was not held in 2013; however, those who have attended a Basic Class in 2013 or a prior year can apply for the Advanced Class in 2014. Information about next year’s summer sessions will be published on the International website and in future issues of the Boilermaker Reporter and the digital Boilermaker Magazine. Participants in the 2013 Basic Class included: Allen Adam, Local 344 (Ridgecrest, Calif.); Janet Aviles, Local 684 (Norfolk, Va.); Hunter Bishop, Local D23, (Clinchfield, Ga.); Christine Bogdanski, Local 696 (Marinette, Wis.); Garrett Kollmann, Local 696; Joshua Dilliner, Local 84 (Paola, Kan.) Nathan Eichorn, Local 84; Moises Fernandez, Local 5 (New York); Johnny Gallon, Local 549 (Pittsburg, Calif.); Ana Garcia, Local 1600 (St. Charles, Ill.); Michelle Kohuf, Local 344; Brian Kruger, Local 650 (Lake City, Minn.); Jeffrey Masta, Local 5; Ryan Mroz, Local 1600; Alger Olson, Local 696; Nicole Reynage, Local 344; Lashaun Singleton, Local 1247 (Chicago); Scott Suave, Local 696; Troy VanAllen, Local 650; Daniel Weber, Local 193 (Baltimore); Gordon Weel, Local 359, (Burnaby, British Columbia); Alison Wilson, Local 684; and Christopher Winemiller, Local 1247.